To assess the impact of somatic hypermutation and selective influences on the Vλ light chain repertoire in systemic lupus erythematosus (SLE), the frequency and pattern of mutations were analyzed in individual CD19+ B cells from a patient with previously undiagnosed SLE. The mutational frequency of nonproductive and productive rearrangements in the SLE patient was greater (3.1 × 10-2 vs 3.4 × 10-2, respectively) than that in normal B cells (1.2 × 10-2 vs 2.0 × 10-2, both P < 0.001). The frequencies of mutated rearrangements in both the nonproductive and productive repertoires were significantly higher in the patient with SLE than in normal subjects. 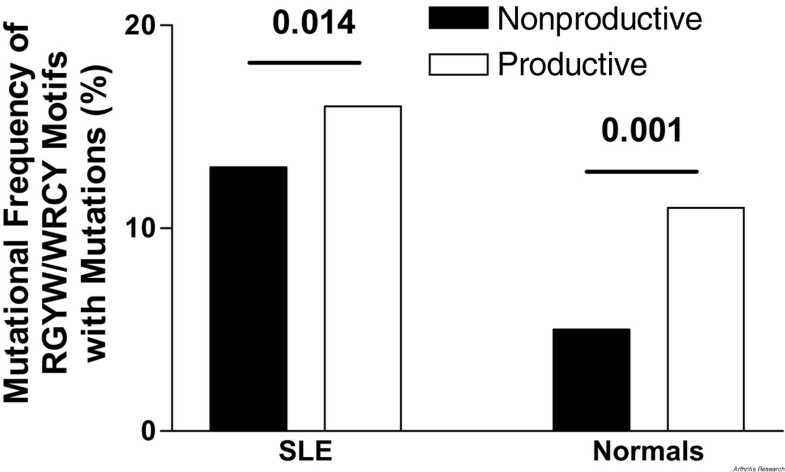 Notably, there were no differences in the ratio of replacement to silent (R/S) mutations in the productive and nonproductive repertoires of the SLE patient, whereas the R/S ratio in the framework regions of productive rearrangements of normal subjects was reduced, consistent with active elimination of replacement mutations in this region. The pattern of mutations was abnormal in the SLE patient, with a significant increase in the frequency of G mutations in both the productive and nonproductive repertoires. As in normal subjects, however, mutations were found frequently in specific nucleotide motifs, the RGYW/WRCY sequences, accounting for 34% (nonproductive) and 46% (productive) of all mutations. These data are most consistent with the conclusion that in this SLE patient, the mutational activity was markedly greater than in normal subjects and exhibited some abnormal features. In addition, there was decreased subsequent positive or negative selection of mutations. The enhanced and abnormal mutational activity along with disturbances in selection may play a role in the emergence of autoreactivity in this patient with SLE. Systemic lupus erythematosus (SLE) is a systemic autoimmune disease characterized by the production of a number of autoantibodies . To date, the etiology of this disorder remains unknown, although genetic, environmental, and hormonal factors appear to influence disease manifestations. There is little information about the molecular mechanisms underlying autoantibody production by SLE patients. It has been suggested that autoantibodies may arise from somatic hypermutation of immunoglobulin genes that have minimal capacity to bind autoantigens in their germline configuration [2,3,4,5,6,7,8,9]. Support for an important role of somatic hypermutation comes from the observation that immunization of mice with pneumococcal polysaccharide can lead to the emergence of anti-dsDNA autoantibodies by somatic hypermutation [3,10]. In addition, V gene rearrangements encoding high-affinity anti-dsDNA antibodies in mouse and man are highly mutated  and back mutation of mutated human V genes to the germline sequence results in a loss of anti-DNA binding . Despite the likelihood that autoantibodies may arise from somatic hypermutation, there is only limited information on the nature and extent of immunoglobulin-gene mutations in patients with SLE. Moreover, the human Vλ gene repertoire has not been examined in detail, largely because it has been delineated only recently [11,12]. The potential importance of the Vλ repertoire in autoimmunity is suggested by the apparent overrepresentation of Vλ gene products in autoantibodies [8,13,14,15,16,17,18]. The production of autoantibodies in SLE is thought to represent an example of immune dysregulation with a resultant break in tolerance. However, the nature of the abnormality in immunoregulation remains a matter of debate. We have previously found a number of abnormalities in patients with SLE that could contribute to the emergence of autoimmunity [19,20], including an increase in genes the mutational activity directed toward VH and Vκ [21,22] and an enhancement of receptor editing/revision [19,20]. In this study, we examined the impact of somatic hypermutation on Vλ rearrangements, which could be particularly important because of the frequent use of Vλ genes by autoantibodies [8,13,14,15,16,17,18]. The data derived by single-cell polymerase chain reaction (PCR) analysis of genomic DNA from individual B cells clearly document two abnormalities, namely, enhanced mutational activity with a bias of G mutations, and diminished selection. Together, these abnormalities could have contributed to the emergence of autoimmunity in this patient. Of the 57 nonproductive VλJλ rearrangements analyzed, 45 (79%) contained one or more nucleotide changes. Only 12 nonproductive sequences (21%) were unmutated. Of the 108 productive VλJλ gene rearrangements, 95 (88%) were mutated and 13 (12%) did not harbor mutations. In normal subjects studied previously , 27/55 nonproductive Vλ rearrangements (49%) contained mutations. In the productive repertoire of the normal subjects, 100/174 sequences (58%) harbored mutations. Overall, the VλJλ repertoires of the patient with SLE exhibited a significantly greater frequency of mutated sequences in both the nonproductive and the productive repertoire (P < 0.001 for both). The mutational frequencies of the nonproductive and productive repertoires are shown in Table 1. There was a significantly higher mutational frequency in the productive than in the nonproductive rearrangements when the entire set of VλJλ genes was considered (P = 0.022) but not when only the mutated Vλ rearrangements were analyzed. In normal subjects, by comparison, the mutational frequency of the productive rearrangements with mutations (2.0 × 10-2 per base pair) was significantly greater than that of the mutated nonproductive repertoire (1.2 × 10-2 per base pair, P < 0.001). J = joining [region]; NS = not significant; V = variable [region]. Further analyses assessed mutations in the complementarity-determining regions (CDRs) and framework regions (FRs). Of all mutations of Vλ in the patient with SLE, 42% (174/412) of the nonproductive and 44% (356/807) of the productive rearrangements were in CDRs, while the respective values for FRs were 58% (238/412) and 56% (451/807). The corresponding values in normal controls were 65% of the nonproductive and 58% of the productive mutations in CDRs, versus 35% and 42%, respectively, in FRs . In normal subjects, the frequency of mutations was significantly higher in the CDRs than in the FRs (P < 0.005), in both nonproductive and productive rearrangements, contrasting with the SLE patient's significantly higher frequency of FR mutations in both repertoires (P < 0.005). The frequency of replacement (R) mutations in the CDRs and FRs in the nonproductive and productive repertoires was comparable in the SLE patient (Table 2), whereas the normal subjects had a reduced R/S ratio in the FRs of the productive repertoire (P < 0.05). Overall, the R/S ratios found in the nonproductive and productive repertoires of the patient with SLE did not greatly differ. However, this patient had a significantly higher R/S ratio in the CDRs than in FRs compared with normal subjects, in both the nonproductive (P < 0.01) and the productive (P < 0.001) repertoire. *The data for normal subjects have been published elsewhere . aSignificant difference between ratio in SLE patient and normal subjects; P < 0.05 (Χ2 test). bSignificant difference between ratio in nonproductive and productive rearrangements; P < 0.05 (Χ2 test). CDR = complementarity-determining region; FR = framework region. In comparison with the normal subjects, the patient with SLE had a significantly higher R/S ratio in CDRs (P < 0.005) but not in FRs. As shown in Fig. 1, there were some striking differences in the nature of the nucleotide substitutions between the patient with SLE and normal subjects. Based on the occurrence of the base pairs in the germline sequences and the assumption of a random mutational process, the expected distribution of mutations would be as follows: T, 23%; C, 31%; A, 21%; and G, 25%. However, in the patient, 41% of Gs were mutated (169/412; Fig. 1), significantly exceeding the expected frequency of 25% (P < 0.001). In contrast, 23% of As were mutated (95/412) – a value close to the 21% that would be expected by chance. The frequencies of mutations of T (14%, 59/412) and C (22%, 89/412) were significantly lower than would be expected (both P < 0.001). Frequency of mutated base pairs of the nonproductive and productive Vλ gene repertoires of the patient with systemic lupus erythematosus in comparison with those found in normal subjects. NHS = normal human subjects; SLE = systemic lupus erythematosus. Similarly, in the productive repertoire, 40% of Gs (319/807, P < 0.001) were mutated significantly more than expected, whereas T (89/807, 11%, P < 0.001) and C (152/807, 19%, P < 0.001) were mutated significantly less than expected. Again A (31%, 247/807) was mutated at a frequency not significantly different from the frequency of the occurrence of A in the germline of the productive repertoire (25%). Comparison of specific mutations between the nonproductive and productive repertoires (Fig. 1) shows that in the patient with SLE, mutations of A were significantly more frequent in the productive (31%) than in the nonproductive repertoire (23%, P < 0.005). In this patient, similar frequencies of mutations were found for G, C, and T in the nonproductive versus the productive repertoire. (For additional data, see Supplementary material). In the nonproductive and productive repertoires of the SLE patient, purine transversions (37% and 38%, respectively) and purine transitions (30% and 32%, respectively) were the most frequent substitutions (Table 3). Pyrimidine transversions (17% and 15%, respectively) and pyrimidine transitions (16% and 14%, respectively) were found significantly less frequently in both repertoires (P < 0.001 for both). In the normal subjects, purine transversions (30%) and purine transitions (25%) were more frequent than pyrimidine transversions (21%) and pyrimidine transitions (24%), although these differences were not significant. aComparison of nonproductive and productive Vλ genes; P < 0.05 (Χ2 test). bComparison between mutations in the CDRs and FRs; P < 0.005 (Χ2 test). CDR = complementarity-determining region; FR = framework region. Detailed analysis of the findings for the SLE patient revealed that G-to-A substitutions occurred frequently in the nonproductive (21.6%) and productive (18.6%) repertoires. By contrast, mutations from T to A (2.7%) were infrequent. Mutations from A to G were significantly different between the nonproductive (8.0%) and productive (13.0%) repertoires (P = 0.01). Mutations of G to A were significantly increased in the CDRs versus FRs in both the nonproductive and productive repertoires (5.8% vs 15.8%, P < 0.005, in the nonproductive repertoire and 6.9% vs 11.7%, P < 0.005, in the productive repertoire). Since previous studies identified the RGYW motif on both DNA strands as a target of the mutational machinery [24,25,26,27], we made further analyses to determine the targeting of these motifs in the nonproductive and productive gene repertoires of this patient with SLE. In the nonproductive Vλ repertoire, 94/412 mutations (23%) were part of RGYWs and 49/412 mutations (12%) were found in the inverse repeat of RGYW, WRCY. Altogether, 143/412 (35%) mutations were located within these motifs in the nonproductive repertoire. In the productive repertoire, 200/807 mutations (25%) were included within RGYW and 168/807 mutations (21%) were included within WRCY sequences. Thus, 368/807 mutations (46%) were found within these targeted motifs in the productive repertoire. The contribution of mutations within RGYW/WRCY sequences was significantly different between the nonproductive and productive repertoires (P < 0.001). Similarly, there was a significant difference between the mutations within RGYW/WRCY sequences in the nonproductive (38%) and the productive repertoires (51%) of normal subjects (P = 0.033) , but there were no significant differences between normal subjects and the SLE patient. In this study, we analyzed the frequency and distribution of mutations of Vλ chain rearrangements obtained from individual peripheral B cells of a patient with early, previously undiagnosed SLE and compared the findings with previous findings for normal subjects. A previous study of the V gene usage of the patient showed that central receptor editing of the Vλ and peripheral editing of Vκ gene rearrangements were more active than in normal subjects [19,20]. Recent analysis of mutations of VH and Vκ rearrangements from this patient also revealed significant differences in comparison with normal subjects [21,22], including a greater mutational frequency, enhanced mutations of Gs, comparable targeting of RGYW/WRCY motifs, and apparent abnormalities of selective influences shaping the mutated V gene repertoire. Differences between the patient and normal subjects in the frequencies and patterns of mutations in the nonproductive repertoire are likely to reflect abnormalities in mutational activity. The current study indicates that the mutational machinery was significantly more active in this untreated SLE patient than in normal subjects, as judged from the number of mutated Vλ genes and from the mutational frequencies; these findings are consistent with findings of Vκ and VH rearrangements from this patient [21,22]. These results suggest that the entire immunoglobulin-gene repertoire was mutated to a greater degree than in normal subjects. By contrast, de Wildt et al  recently reported no differences in the mutational activity in SLE patients from that in normal subjects. However, that study analyzed individual rearrangements of IgG+ B cells from two patients with 'SLE-mixed connective tissue disease'. Differences between the patients analyzed, the impact of treatment, the effects of preincubating individual B cells with EL-4 B5 thymoma cell lines, and the selection of B cells producing immunoglobulin in that study could explain apparent differences from our present study. In addition, the mutational frequencies estimated in the study of de Wildt et al  (ranging from 4.8% to 8.8%) cannot be compared with our present data, because of methodological differences (analysis of mRNA from a defined subpopulation and stimulation before the analysis). Moreover, detailed mutational analyses were not reported, precluding a firm conclusion. Another indication of abnormal activity was the overwhelming contribution of G mutations. In the patient with SLE, 41% of all mutations in the nonproductive repertoire and 40% in the productive repertoire were nucleotide changes of G. The same overabundance of G mutations was found in VH rearrangements (39% in the nonproductive and 42% in the productive repertoire) and Vκ rearrangements (50% in the nonproductive and 53% in the productive repertoire) of this patient [21,22]. This is noteworthy because previous analyses of VH (26% in the nonproductive and 26% in the productive repertoire)  and Vκ gene rearrangements (30% in the nonproductive and 28% in the productive repertoire)  in normal subjects provided no evidence for preferential mutation of G. Alternatively, it cannot be formally excluded that the preferential mutation of G mutations is an idiosyncrasy of this SLE patient. Additional studies will be necessary to assess this possibility. Although the mutational machinery was markedly enhanced in peripheral B cells of this patient in comparison with that in normal subjects, it remains likely that the CD19+ B cells analyzed contained a higher percentage of memory B cells. Therefore, comparison with the previously reported IgM+ B cells may have overestimated the apparent mutational frequency in the SLE patient. Significantly more mutated Vλ rearrangements were found in the SLE patient than in CD19+ B cells of a normal individual  – a finding consistent with the conclusion that the frequency of memory B cells is higher in SLE. Indeed, a recent study  identified a higher proportion of CD27+ memory B cells carrying somatically mutated V rearrangements in the periphery of SLE patients. However, even when analyses were confined to VλJλ rearrangements with mutations, the mutational frequencies of the nonproductive and productive repertoires were significantly greater in the SLE patient, indicating that, in addition, the impact of mutational activity on memory cells of this patient was greater than in normal subjects. Additional evidence of major abnormalities in selection became apparent when the mutational frequencies of productive and nonproductive Vλ repertoires were compared. Whereas there were clear indications of positive selection of mutations in Vλ rearrangements in normal subjects, with increased mutational frequencies in productive compared with nonproductive repertoires (1.2% vs 2.0%, respectively, P < 0.001) , no such difference was noted in the Vλ repertoires of the SLE patient. A similar pattern was previously noted in the Vκ  and VH gene repertoires [22,24]. As opposed to normal subjects, no clear evidence of positive selection of mutations was found in the SLE patient. This positive selection of mutations was documented by almost comparable mutational frequencies, the distribution of mutations within codons, and the R/S ratios of productive and nonproductive rearrangements, which are all consistent with the conclusion that the imprint of selection as evidenced by differences between the nonproductive and productive repertoires was not as evident as previously identified in normal subjects. Although there was evidence of differences in mutational activity in the SLE patient, overall targeting of mutations to RGYW motifs on both DNA strands, as manifested in normal subjects [23,24,26,31,32,33,34] by an increased mutational frequency of RGYW/WRCY motifs on the sense strand [23,27,33], appeared to be intact in the SLE patient. However, the lack of positive selection of RGYW mutations (mutational frequency 16% in both the nonproductive and the productive repertoire) was remarkably different from what is seen in normal subjects, who manifested clear evidence of positive selection of RGYW mutations. The increase of WRCY mutations from the nonproductive (10%) to the productive (17%) repertoire was very similar to normal subjects and patients with another autoimmune disease, Sjögren's syndrome [31,35] These findings suggest that there are unique abnormalities in the selection of mutations in patients with SLE. Our study identified markedly enhanced mutational activity and distinct abnormalities in mutational targeting, in a patient with active, untreated SLE compared with normal subjects. In addition, there was decreased subsequent positive or negative selection. These abnormalities may be involved in the emergence of autoreactivity in this patient with SLE. The patient analyzed fulfilled the revised criteria for classification of SLE [S1] and the case has been described in detail previously [19,20]. Preparation of peripheral blood mononuclear cells, fluorescence-activated cell sorting of individual CD19+ B cells, and the method of PCR amplification of human Vλ gene rearrangements have been described in detail recently [S2]. The single-cell PCR methodology used made it possible to amplify genomic DNA of immunoglobulin-gene rearrangements from peripheral B cells and, thereby, avoid biases inherent in analyzing cell lines or cDNA libraries [S3,S4]. Since genomic DNA was amplified, productive as well as nonproductive Vλ rearrangements could be amplified, sequenced, and analyzed. Analysis of the nonproductive repertoire is especially important in assessing the immediate impact of somatic hypermutation, as the nonproductive rearrangements do not encode a protein and therefore do not influence selection of B cells expressing these rearrangements. In contrast, the distribution of B cells can be shaped by a variety of selective influences during development and subsequent antigenic stimulation, based upon the nature of the expressed immunoglobulin heavy or light chain. The PCR error rate for this analysis has been documented to be approximately 1 × 10-4 errors/base pair . Thus, few if any of the nucleotide changes encountered in this analysis can be ascribed to amplification errors. The previously published  mutational frequency and pattern of hypermutation of VλJλ rearrangements from two healthy normal male donors (26 and 45 years old) served as a basis of comparison. Both the nonproductive and productive repertoires of these two normal, age-disparate donors exhibited an overall similar usage of Vλ and Jλ gene elements [S2]. Sequences were analyzed with the Χ2 test to compare the differences in the mutational frequencies between the VλJλ rearrangements of the SLE patient and the normal subjects. The goodness-of-fit Χ2 test was used to compare the nature of individual mutations of nucleotides to their expected mutational frequencies based on their occurrence in the germline. P values < 0.05 were considered to be statistically significant. Mutational 'hot spots' were identified by determining the mean number of mutations of each codon and identifying codons that had more mutations than the mean +1.96 SD (95% confidence interval) of the mean mutations of the group . In this analysis, the overall mutations of both nonproductive and productive gene repertoires were assessed excluding the portions of FR1 that could not be analyzed because of the primers used. Previous analyses in normal subjects detected specific codon positions with a higher mutability within the Vλ rearrangements . Thus, in normal subjects, codon position 51 was found to be mutated significantly more frequently in the nonproductive repertoire, whereas codon positions 38, 50, 51, 53, 95a, and 95b of productive gene rearrangements were more frequently mutated. The patient with SLE, however, manifested some notable differences (Supplementary Fig. 1). Significantly more mutations (outside of the 95% confidence interval) were detected in codon positions 53 and 94 of nonproductive rearrangements and in positions 33, 38, 50, 51, 53, 66, and 94 in the productive repertoire. No mutations occurred in codon positions 23, 35, 40, 44, 63, or 88 of the nonproductive or 63 of the productive repertoire. Thus, whereas mutational hot spots at positions 38, 50, 51, and 53 in the productive repertoire were similar between normal subjects and the patient with SLE, there were additional hot spots in FRs of the patient. Distribution of mutational events within the nonproductive (left panel) and productive (right panel) Vλ rearrangements in CD19+ B cells from a patient with systemic lupus erythematosus. The percentages of mutated codon positions are given and the mutational hot spots are indicated. Mutational hot spots were determined as described in Supplementary materials and methods. Codons used only by a few rearrangements were not considered in the diagram. CDR = complementarity-determining region. Comparing the mutational frequency of base pairs between the nonproductive repertoire of the patient and that of the controls, mutations of T were found more frequently in normal subjects (30%) than in the patient with SLE (14%, P < 0.001), whereas mutations of G were more frequent in the patient's repertoire (41%) than in the controls (25%, P < 0.005). Base substitutions of A and C occurred at comparable frequencies in the patient and in normal subjects. In the productive repertoires, substitutions of G were also found significantly more frequently in the patient (40%) than in normal subjects (29%, P < 0.001). By contrast, C (27%) and T (17%) nucleotides were mutated significantly more frequently in normal subjects than in the patient (C, 19%; T, 11%; P < 0.005 each). When the number of RGYW/WRCY mutations was compared with the occurrence of these motifs in the germline sequences, 16% of RGYW sequences (94/601) and 10% of WRCY motifs (49/487) contained mutations in the nonproductive repertoire. The difference in these mutational frequencies was significant (16 versus 10%, P < 0.007). In the productive repertoire, 16% (200/1250) and 17% (168/993), respectively, of these sequences were also found to be mutated and the frequency of mutations did not differ significantly between them (P = 0.56). Only the difference of WRCY mutations was significant when the nonproductive and productive repertoires were compared (10% vs 16%, P < 0.001). Overall, there was a significant difference between the mutational frequency of RGYW/WRCY quartets in the nonproductive repertoire (13%, 143/1088) and the productive repertoire (16%, 368/2243, P = 0.014, Supplementary Fig. 2). Mutational frequencies of RGYW sequences and those of their inverse repeats, WRCY, in the nonproductive and productive Vλ gene repertoires of the patient with SLE and in normal control subjects. SLE = systemic lupus erythematosus.